HCX’s 4th annual summer concert series Mizik Ayiti! concluded with a bang on Thursday, September 2nd, as participants got a chance to get their pre-labor day jam on with the amazing talent of Earthman Experience, and Paul Beaubrun with Zing Experience at DROM in New York city. As guests made their way to the event, they were treated to an impromptu performance of traditional rara music , setting the mood for the evening. DJ Hard Hitting Harry followed suit with his afro-beat/house playlist. He was later joined by the other members of Earthman Experience, presenting selections that were both spiritual and electrifying. Richard “Earthman” Laurent, his daughter Soleil Laurent and others presented selections which included “Climbing To The Sky”, “Fighting For Life”, and “Bang For Freedom”. The evening culminated with Paul Beaubrun and Zing Experience. Paul captivated the audience with his rich vocals and his stellar guitar playing. Listeners were blown away with classic pieces such as “Ma Woule”, “Ezili”, and a crowd favorite “Ayizan”. 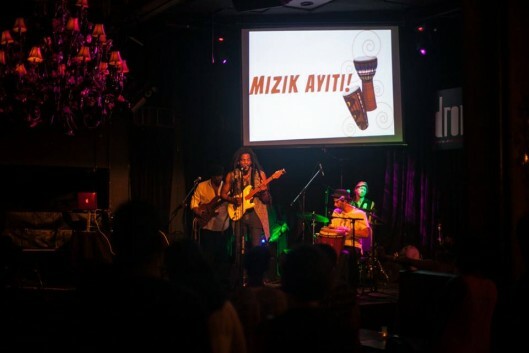 It was truly an experience listening and dancing to the music – a perfect blend between mizik rasin, reggae and rock. We thank all those who were able to make it out to our final Mizik Ayiti event of 2015!. We hope that you were able to jam with us this summer. Until next year! Click here to take a look at pictures from the night! This entry was posted on Wednesday, October 14th, 2015 at 1:31 pm	and is filed under Archive, Arts, Events, HCX Programs, Mizik Ayiti, Music. You can follow any responses to this entry through the RSS 2.0 feed. You can leave a response, or trackback from your own site.